The majority of the cars produced in recent years need the installation of a bypass relay. However, as a general guideline you should keep in mind that a bypass relay is necessary for all vehicles equipped with control check, multiplex other Canbus. 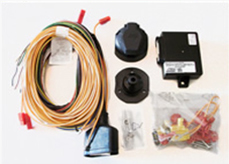 These bypass relay wiring kits are the same as the first ones, with the addition of a bypass relay. It's available both 7 pin and 13 pin version with the same features already described. The wirings with universal bypass do not bear upon the energy charge of the traditional lines of the vehicles, the lights of the trailers can be used simply through the control board of the vehicle and are battery controlled. 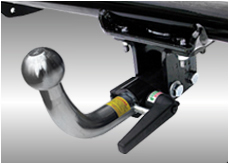 This way it is possible to avoid damages to the electrical and electronic components of the vehicle that can happen following overcharge, short- circuits, polarity inversion and in addition to this protects the electrical cables of the vehicle from overheating and improves the use, so that the cables can last longer. It is therefore better for the warranty. • A better use: only one product for every tested vehicle. • It is not invasive and does not modify the electrical system of the vehicle if properly used according to the manual. • It is compatible with vehicles that use back lamps with one or two filaments, led lights, double function lamps. • Eu approval according to 2006/28/CE guideline. In accordance with the norm ISO 11446:2004: every power cable is dimensioned to avoid overcharge and damages as a consequence. • Signalling if failure occurs of the lights of the trailer. • Bypass relay off when there is no trailer so it does not consume energy. • Bypass relay automatically on when the trailer is attached to the vehicle or with the use of the tester (see accessories) to verify the correct functioning.